We're out here on the rolling Rochester Hills at the site of this weekend's Meadowbrook Concours d'Elegance for the US press reveal of the Alfa Romeo 8C Competizione. 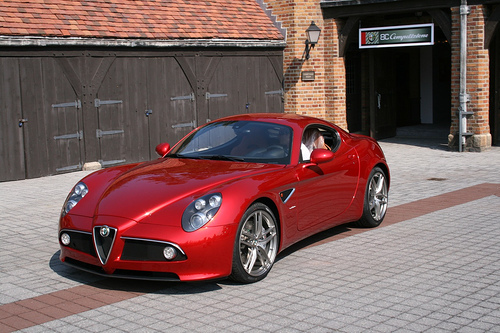 But just as important as showing the 159,300 euro (Alfa folks claim the US price will be over $200K when it hits here late in 2008), 450 HP V8-powered supercar, for the Alfa Romeo folks this is the first event for a US-bound Alfa Romeo since the halcyon days of yesterday — and by yesterday we mean 1995. We'll stop talking and let you soak in the crimson-colored beauty of these shots.